Article abstract – We treated 20 patients with writer's cramp in a double-blind, placebo-controlled study. Each patient received two treatments in tandem, one with botulinum-A toxin (BTX-A) injections and another with normal saline, separated by 3 months. Treatment order was randomized and unknown to the patient and physician. Patients were assessed before each treatment and 2 and 6 weeks after each treatment by objective measurements of pen control. Twelve patients had improvement in pen control after treatment with BTX-A, but only four had significant improvement in writing. BTX-A injections are effective in relieving symptoms in selected cases of writer's cramps, particularly in those with significant wrist-joint deviation. Writer's cramp is a focal dystonia characterized by involuntary muscle contractions in the upper limb when the patient writes, despite normal control of the limb in performing other activities. The contractions may be painful and the patient loses control of the pen. This may be associated with contortion of the wrist, elbow, and occasionally the shoulder. Numerous methods of treatment including anticholinergic drugs, behavioural therapy, biofeedback, hypnotherapy, and surgery have been proposed in the past, [1-3] but none have been successful. There have been reports [5,6] on the use of writing aids in selected groups of patients. Open-label studies have demonstrated efficacy of botulinum-A toxin (BTX-A) in relieving the symptoms of writer's cramp. [7-9] We carried out a double-blind, placebo-controlled study in 20 patients to evaluate this method of treatment. Twenty patients with writer's cramp who had severe symptoms were included in the study. All patients experienced symptoms within minutes of picking up a pen to write. The writing disability was not associated with any significant hand tremor. Pain in the limb was experienced in 12 patients. There were 13 men and seven women, with a mean age of 41.75 years (range 28 to 58 years). All patients were not on medications for at least 6 months prior to the study. Mean duration of symptoms was 5.15 years (range 2 to 14 years). Each patient was given two sets of injections, with a treatment interval of 3 months. One set consisted of BTX-A and the other consisted of an equal volume of normal saline, given in random order. The patients, the physician performing the injections, and the physician assessing the patients were all blind to the order of treatment. The muscles injected were determined by clinical examination, and in 8 patients EMG was employed to guide selection of muscles. The muscles selected for injection included the flexor digitorum superficialis (30 mouse units, or MU), flexor digitorum profundis (30 MU), flexor carpi radialis (30 MU), flexor carpi ulmaris (30 MU), flexor pollis longus (25 MU), extensor digitorum (50 MU), extensor carpi ulnaris (30 MU), pronator teres (30 MU), and pronatur quadratus (30 MU). The dose was decided from experience treating previous patients (none included in this study) open-labelled. Assessment was carried out before each treatment and 2 and 6 weeks after each treatment. Three objective tests were applied, in addition to a subjective report from the patient. The equipment consists of a digitized pad connected to a computer (PDP-11). Four pairs of dots are printed on the pad, and the distance between the dots is 1.5 cm. The four pairs are arranged in horizontal, vertical, ascending sloping, and descending sloping directions. The patient is asked to sit down comfortably and hold a pen in the hand. A switch is activated each time the pen touches the pad. The patient begins by alternatively hitting point A and point B of the first pair of dots with the pen repeatedly and as quickly as possible. The computer averages out the results from 40 hits and gives readings for the speed of movement (cm/sec) and accuracy of the hits (mm away from the center of the dots). This process is repeated by asking the patient to hit the remaining three pairs of dots in succession. Table 1 – Objective measurements of pen control. Table 2 – Response versus wrist-joint deviation. The maze is shown in the figure. The patient is asked to trace the path in the maze from the center and work spirally outward with the pen as quickly as possible. 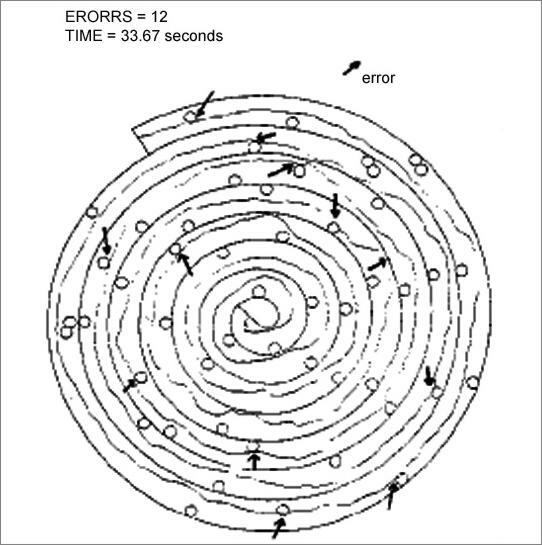 If the tracing touches any obstacle circles or the wall of the maze, it is recorded as an error. The number of errors made in the time taken for the patient to complete the maze are recorded. Three trials are given and the best pair of results taken. Fig. 1 – Example of a patient's performance on Gibson's maze. The time taken to complete copying is recorded. If completed, the number of words per minute is calculated. The writing samples from each patient are randomized and given to a "blind" physician for scoring according to a scale of 0 to 3 (0 = totally illegible; 1 = some words illegible; 2 = all words legible, some with difficulty; and 3 = all words easily legible). Patients are asked to report whether they notice any changes in writing, in terms of -1 = worse; 0 = no change; 1 = improvement; and 2 = dramatic improvement. Clinical examinations of the patients after the treatment with BTX-A all demonstrated weaknesses in the muscles injected. Wilcoxon signed-rank test was applied to test improvement in objective tests, and the probability calculations were all two-tailed. Speed and accuracy of pen control improved significantly as a group after treatment with BTX-A, whereas no significant changes were detected after treatment with placebo. Twelve patients improved in pen control in one direction only. Improvement in two directions was found in seven patients after treatment with BTX-A, and none after placebo. Speed of completion of Gibson's maze improved in nine patients, and fewer errors were made in seven patients after treatment with BTX-A. As a group, both improvements were significant. No patients improved after treatment with placebo. Data on the above two tests are summarized in table 1. Writing speed improved in seven patients. Writing scored better in four patients after treatment with BTX-A, and subjective improvements in writing was also reported by the same four patients. The pattern of dystonic posture was divided into two categories: one group with a significant deviation of the wrist (n = 13), and another group with the hand seized up with the wrist in the neutral position (n = 7). 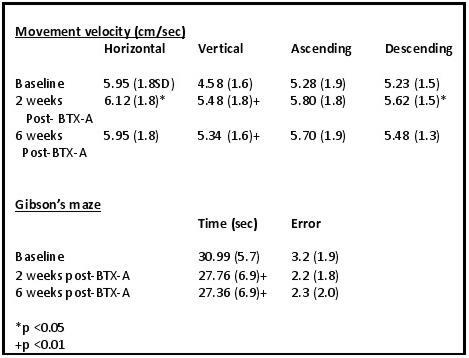 The results were divided according to the pattern of wrist posture, summarized in table 2. Applying the chi-square test, the results suggested that responders were patients with significant wrist-joint deviation (p = 0.001). Subjectively, eight of the 12 patients who had pain associated with the writer's cramp reported pain relief after treatment with BTX-A. In the BTX-A group, four patients reported definite improvement in writing after BTX-A treatment (score of 2). Two patients reported slight subjective improvement in writing (score of 1). No changes in writing were noted in 13 patients (score of 0). In one patient, pen control was worse (score of -1) for 8 days after treatment with BTX-A because the muscles injected became too weak. This recovered spontaneously. No other side effects or systemic adverse reactions were reported. No changes were experienced in those receiving placebo treatment. Writer's cramp has complex patterns of involvement of muscles, but frequently the muscles involved may be determined after clinical examination of the patient without the aid of EMG. However, for deep-lying muscles (such as the pronator teres and qudtratus), we find EMG helpful in localizing these muscles for injection. Treatment with BTX-A resulted in improvement in pen control in certain directions only, but in most cases, this was not sufficient to bring about significant improvement in writing. This is due to writing being a complex motor process that requires coordination of many muscles in the forearm. The abnormality in writer's cramp is complicated, and is action and posture dependent. Weakening isolated muscles in the forearm is likely to correct only one aspect of pen control in some cases. This study was designed so that each patient received one active treatment, and the effects observed may not be optimal. In conclusion, BTX-A injections are effective in relieving symptoms only in selected cases of writer's cramp, and the clinical features most useful in predicting outcome is distortion of wrist posture. – Supported by the British Columbia Health Care Research Foundation and the Dystonia Medical Research Foundation – Article originally printed in NEUROLOGY 1993;43:183-185.